Starting tomorrow I am going to share with you 'World's Best Presentation Tips'. 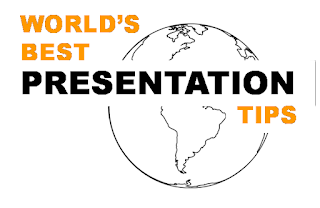 There are many websites and blogs on presentations and most of them have hundreds of posts. Which are the best ones? Tips which will make a difference and share with you something really great. With this objective in mind I wrote to many popular presentation bloggers of our times. The replies have started to pour in. I am excited to share this news with you. In the next few posts I am going to bring to you something you have never seen before. Presentation bloggers from all over the world will share their favourite posts with all of use here at All About Presentations. Keep checking this website once in two three days for the next few weeks. Some really good content is coming your way, exclusively for the reader of this blog, first time in the world. I am excited. Thanks Sujith. Expecting your comments and feedback on the posts.